“It is now our concern how we balance between keeping traditional gogumi technique and meeting the demand of the age. A while ago, a friend of mine who runs a tea shop told me so. “Gogumi” means tea blend in Japanese. 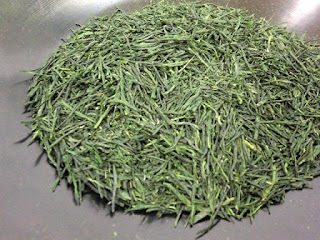 For many years, gogumi has been one of the key processes to provide good tea with stable price and taste to Japanese people. It takes a while for people to master gogumi skill, and gogumi is one of the traditional techniques. But recently, the single origin tea and specialty tea, whose gogumi process are not required, are getting popular. To be honest, I prefer single origin tea to gogumi one because I take it more special. But today, one of my friend who prefer “the usual” said to me; I drink single origin tea or so, but “The usual” makes me relax. It’s a must. "The usual" means the tea which is gogumi blended. It was a casual conversation , but a food for “tea” to me.